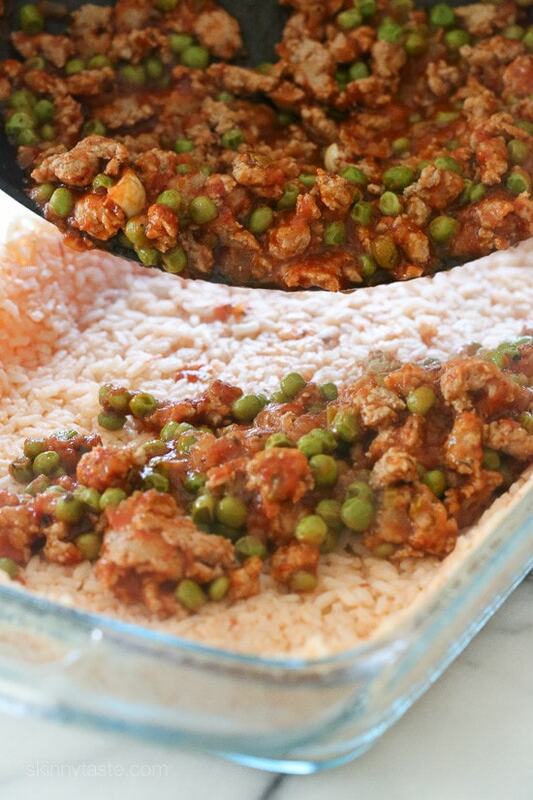 Sicilian Rice Ball Casserole filled with ground turkey and a little sausage adds lots of flavor, plus peas and sauce. Freezes well, great for potlucks and family friendly! This casserole recipe takes one of my favorite appetizers (arancini) and turns it into a weeknight meal. If you don’t like peas, swap it with another vegetable. I’m thinking of trying a broccoli and sausage version next. 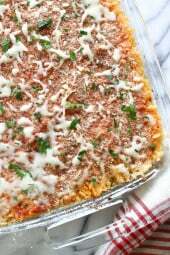 More casserole recipes I love are Chicken Sausage and Peppers Macaroni Casserole, Spiralized Turnip and Potato Au Gratin Casserole and Tuna Noodle Casserole. I can’t take full credit for this, this is pure genius from my friend Julia of Julia’s Healthy Italian. I tweaked her recipe to lighten it up a bit, but she takes full credit for the creativity. Servings are large and very satisfying, you could serve a simple green salad on the side if you want more greens. 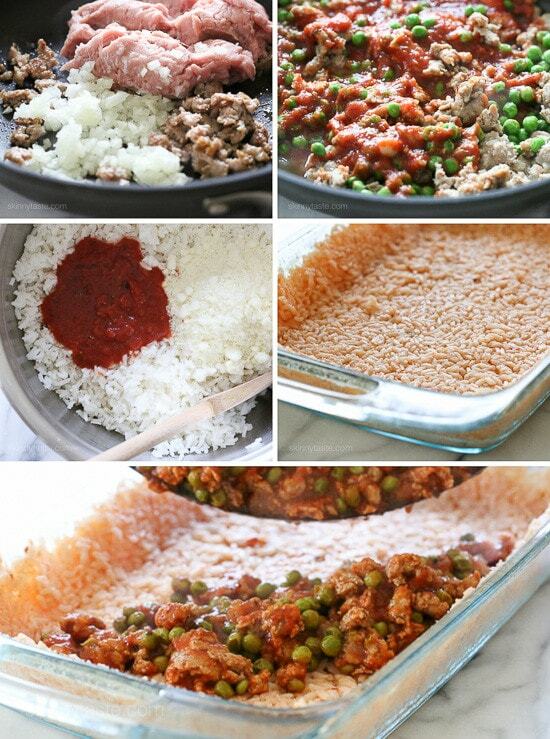 The filling is ground turkey with a little sausage that adds lots of flavor, plus peas and sauce. If you don’t like peas, swap it with another vegetable. I’m thinking of trying a broccoli and sausage version next. Julia usually makes double and freezes the second casserole to use later. I halved her original, but it makes sense to make two for the same amount of work it takes to make one. 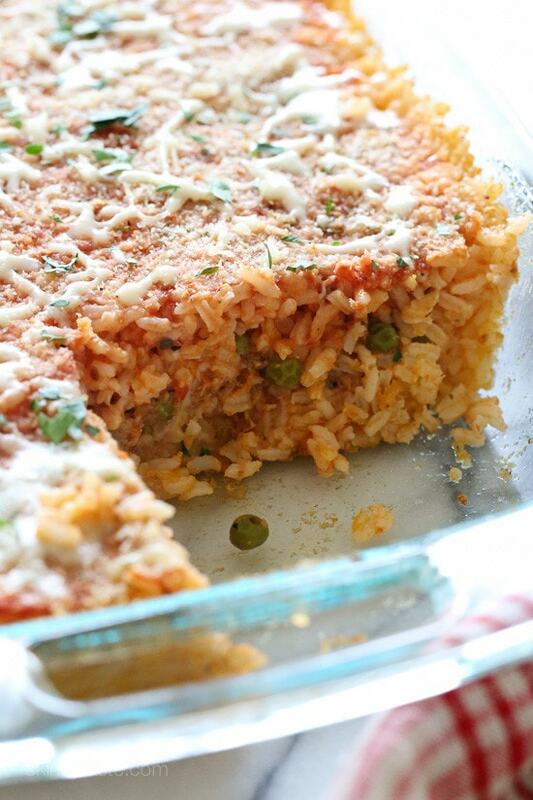 I serve mine with a little extra sauce on the side and have also made this with brown rice and it works great. 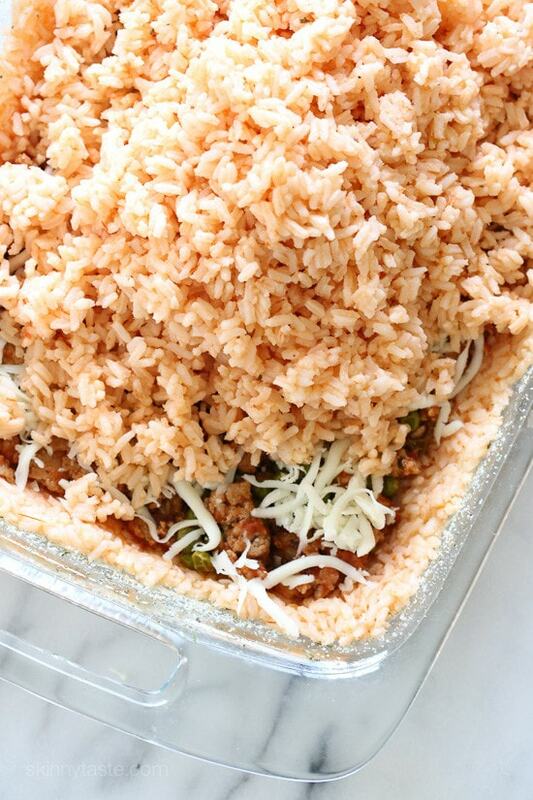 To make this quicker you can make the rice ahead of time as well as the sauce. I used my filetto di pomodoro recipe, but you can use your favorite sauce. I recommend either using the 93% lean turkey, I found the 99% lean turkey was too dry and the points remain the same. Cook rice with 1 teaspoon kosher salt according to package directions. Set aside to cool. Meanwhile, sauté sausage meat; cook until brown breaking up into pieces with a wooden spoon as it cooks. Add turkey and onions and cook until browned, breaking up as it cooks. Season with 3/4 teaspoon salt and black pepper to taste, then add peas and 1 cup sauce; simmer on low, covered, about 20 minutes. 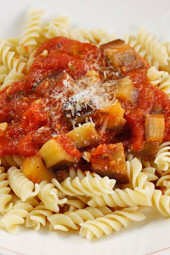 In a large bowl combine cooked rice, pecorino romano, eggs, and 1/2 cup tomato sauce and mix well. Rice should be a bit sticky. Spray a 9 x 13 casserole dish with cooking spray, making sure to spray sides too. Add 2 tbsp breadcrumbs to the dish and roll around to coat the bottom and sides. Take half of the rice mixture (a little more if needed) and cover the bottom of the dish and up the sides; press to form the bottom layer. Fill with the meat and peas. 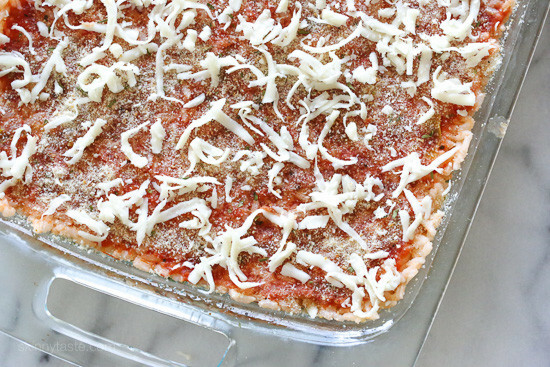 Top with 3/4 cup mozzarella cheese. Cover with remaining rice and press until even. Top with remaining sauce, remaining 2 tbsp breadcrumbs, and remaining 1/2 cup mozzarella. Cover with foil and bake 30 minutes, until hot. Garnish with parsley or basil if desired, cut into 8 pieces and serve. White size baking dish should this be cooked in? 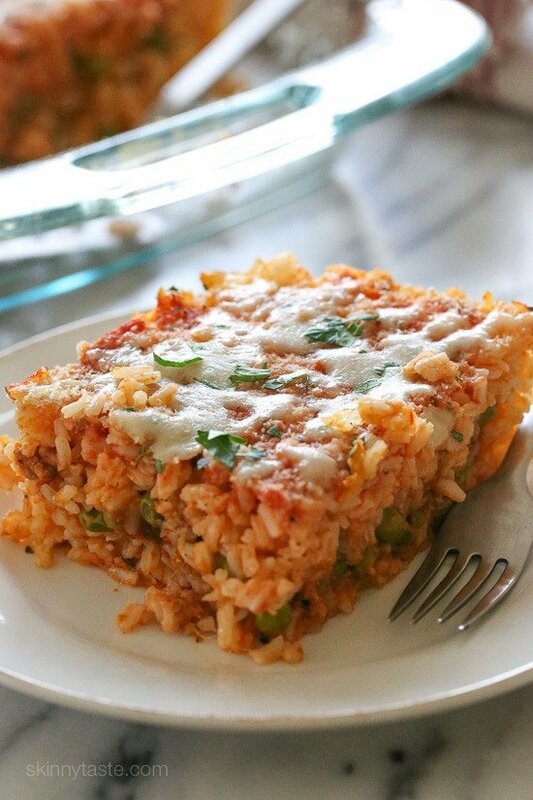 My Italian family has been making a similar version of this dish for years and everyone loves it. It’s great for parties too since you can serve it at room temp. Our variation is to saute in oil: 1/2 lb hamburger, 1/2 lb sausage crumbled, 1 chopped onion, clove minced garlic. Transfer to large bowl and mix in 4 cups cooked rice, 1 beaten egg, 3/4 cup Romano cheese., 1 can cream of chicken soup, and 28 oz can tomato sauce. Pour mixture into 9×12 greased baking dish. Beat another egg and brush over the top (this will form a golden glaze over the top that helps keep it together when cutting squares). 375 degrees for 1 hour. I bet it’s great with peas, too! WOW! My family truly loved this recipe! When you substitute half cauliflower rice, do you cook the cauliflower rice first? Or do you mix the uncooked cauliflower rice with the cooked rice? The link still isn’t working. Not sure what happened, works now. Happily eaten by all tonight – kids said it was delicious and the 2 year old asked for more. Husband said it was like Italian fried rice as he ate what was left in the pan before cleaning. Thanks! This is one of the best recipes I have made off of skinny taste!! I use brown rice and ground chicken and it comes out great!! Would this work without the eggs?? I’ve been a loyal follower of your site since 2009 – long time listener first time caller – and I just had to say, this dish hit the spot for me this weekend. It was such a rough week, and I was really in need of a hug – and this dish delivered and then some. Thank you for all the hard work you do. 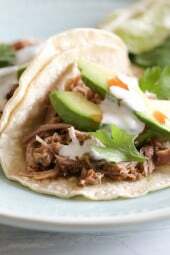 I’ve never followed a site where the recipes are just so consistently delicious and reliable! 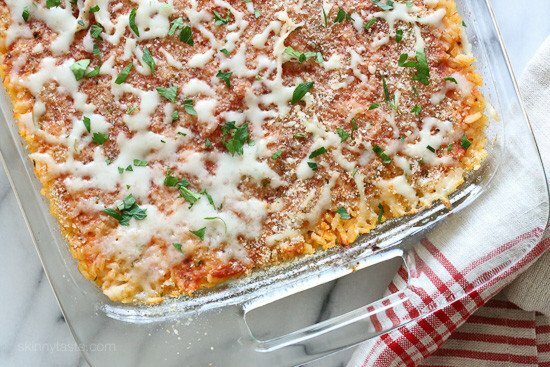 Is there a store bought tomato sauce that I can use that won’t add more points to this recipe? Can you just use Tuttorosso canned tomato sauce or is it too bland on its own? Would it be ok to just eliminate the meat altogether for a vegetarian version? Rather than use a substitute? I can substitute protein somewhere else. This looks amazing. Gina! I’m thinking of substituting chicken sausage for the pork. I’ve been making my pizzas with it and, even though I love Italian pork sausage the chicken is pretty good. And it would probably make it even healthier. Right? I love your recipes and your website! I’m making this ahead of time. I’m going to prepare it up to baking. When I bake it how long and for what temp? This was amazing! Gina you have the most creative recipes. I ended up using half frozen cauliflower rice because I did not have enough white rice in the house. But it was great, you couldn’t taste the cauliflower at all. This was a huge hit! This is delicious and makes a ton. We always have left overs! Made a vegetarian version of this last night with soy crumbles in place of the meat and it was great! I made it with brown rice cooked in veggie broth for a little extra flavor as well. Are the calories and fat content per serving based on a full fat italian sausage or a chicken sausage like most of your recipes? Anyone know how long to cook this if it has been frozen ?Thank you ! Anybody tried this with a veggie substitution, such as the suggested broccoli? 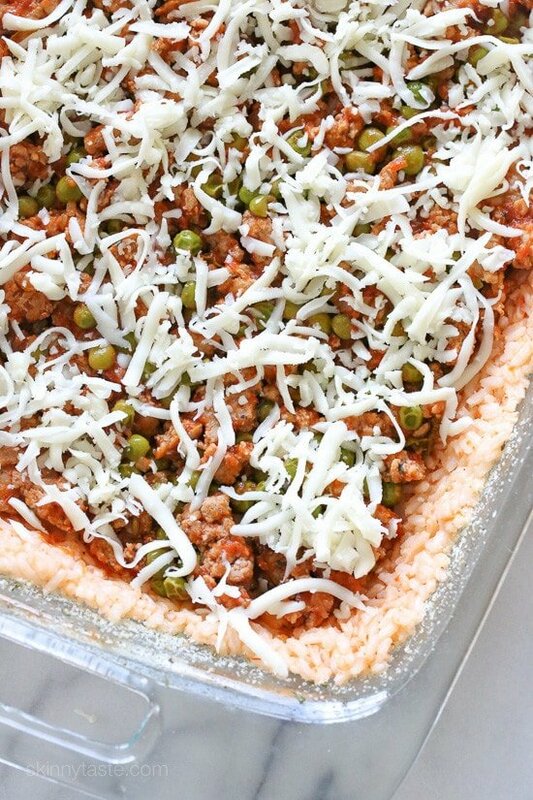 I’ve made this before with peas and it was declicious, just curious what others have tried and how it turned out. 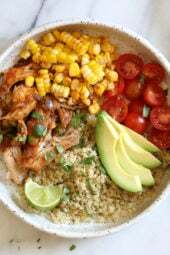 Can I use quinoa instead of rice ? My grandmother came to the US from Sicily, and she made us rice balls using her family recipe. They are labor intensive and time consuming to make, but such a delicious treat! Her recipe is a little different from yours, but I used your outline to make her rice balls into a casserole. Fantastic! I’m so excited. It’s so much easier and faster, so I’ll definitely be making this often. It’s pure comfort food to me. And an extra bonus is that you use way fewer eggs and far less butter, without sacrificing the taste I expect, so it’s a lot healthier too! Just FYI in case you are interested, the major differences in your recipe do my grandmother’s are that she did not put tomato sauce in the rice (just Romano cheese, lots of egg yolks and tons of butter! ), and to season her meat she used tomato paste, Romano cheese, ground cloves, nutmeg, white wine, and mozzarella. Oh, and no peas, although I know they are commonly used in Italy. From what I understand, the recipes vary widely from region to region. Is this recipe for a 13×9 baking pan? I’m making this for 16 people, want to make it’s the right size or should I double the recipe. I’ve made this as is and with variations, e.g, adding fresh spinach. It’s always a winner! So worth the effort—this is sooo yummy!! I even used half cauliflower rice half regular rice and you can’t even tell. Then I made it into 6 heaping servings for about the same amount of calories. Just made this and LOVED it!! I used chopped green pepper instead of peas and it was delicious!! Tried this today. Used Brown rice and also topped meat layer wirh dollops of ricotta and chopped hard boiled eggs the way my sicilian friend makes her arancini Delicious and healthy Thank you. All I love in a healthier version. Gina, when you say 2 cups of tomato sauce, do you measure with a dry measurement cup or liquid? Have you tried this with cauliflower rice? Had to double the rice, there wasn’t enough to cover the bottom. I also to had more sauce but other than that it was an easy recipe to prepare. This was amazing!! Love all your recipes!! Any thoughts for how to make this vegetarian but still filling? I prefer not to use soy products if possible. I didn’t have frozen peas so I used canned peas and carrots. Very good. Try carrots! Can you (or anyone) recommend a substitute for the peas? Thanks. I made a vegetarian version last night and it was delicious! i swapped the meat for soy crumbles, eggplant and mushroom. So good! 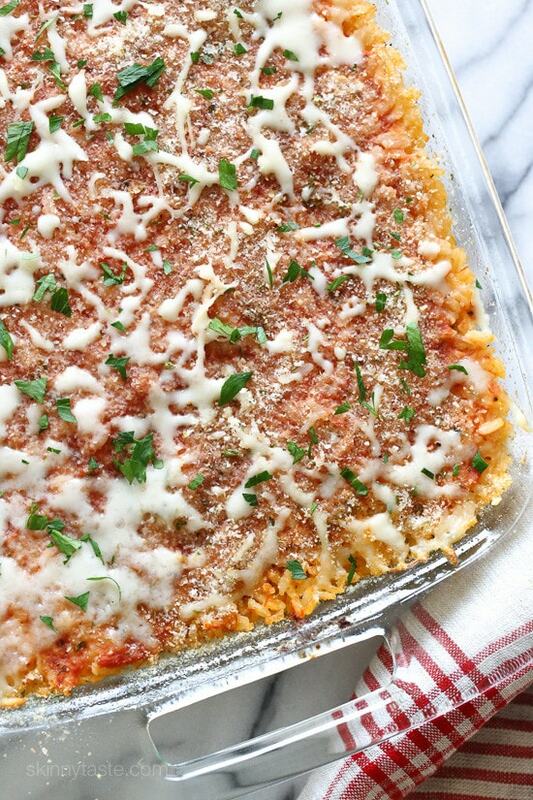 What would be a good substitute for the cheese in the casserole? Loved this Gina, as did the kids! Made this tonight with just ground beef and it was delicious. I can’t wait to eat the leftovers for lunch tomorrow! This is the2nd time I made this. It’s absolutely delish! & it’s gluten- free! I made this using brown rice and a turkey sausage link along with the ground turkey. It was delicious!! Will definitely be a regular on our menu. Thank you! This was incredible! It ended up not being not so “low calorie” for me because I ate two servings, lol. Even my kids loved it and they are so picky. Hi Gina! Love your site. Could I use liquid egg whites instead of the egg? Thank you. Gina, just curious. I entered listed nutritional information for the new weight watchers freestyle and I get 10 points. Am I missing something? they new program, the only way to get accurate points are using recipe builder, which is how I do all my recipes. Calculator will always be wrong. Used riced cauliflower, ground chicken breast and chicken sausage. Got it down to 4sp. If I swap sauce can get it to 3! My son didn’t realize it was cauliflower. Used fresh riced. Now that’s what I call a happy meal! Really great. I struggle a little with making rice stick on sides, but either way, tastes great! Made it a few times. How about making this with cauliflower ? So you only use half a package of ground turkey? (I believe most I’ve seen are 20 oz?) If so, do you think it would be okay to use the entire package? Is this a recipe that will freeze well? What do you think of trying it with cauliflower rice instead of rice? I halved the recipe as well, only needed to increase the amount of tomato sauce. It was DELICIOUS! If I am going to make this to bring to a family pot luck, should I cook it before bringing it and just reheat there, or can it sit assembled to cook a few hours later? I think either way should work. Let me know how it came out! If not using homemade tomato sauce, should I use canned tomato sauce or marinara? You can, Tuttorosso is my favorite. I made this last night and it was unbelievable delicious! I don’t care for peas so I subbed with 3 large mushrooms and a half bag of fresh spinach, chopped, instead. It was also easy to make ahead of time and pop in the oven. I portioned out the leftovers to freeze. Would I be able to make this 2 days prior to eating and store in the fridge? Thanks! I’d like to double it & freeze one. Should I bake it first or freeze before baking? So delicious!! Can you prepare day before and bake the next day? I made this for dinner tonight. Substituted riced cauliflower for half the rice. It was delicious and kids didn’t even know they were eating some veggies! Mommy Score! How do you think it would be with all riced cauliflower? I love rice balls but I don’t eat rice due to weight loss surgery. I would love to make this. Not sure if it will hold. Worked perfect. Recommend using fresh not frozen and cook it gently on stove top. What can you substitute for the frozen peas? My husband is not a fan…I don’t think I could sneak them in. Just don’t put any peas in if he doesn’t like them. What would be a good side dish to go with this meal? Garlic bread? Pasta? A nice salad would be good too! Is there a difference in FSP if you use brown rice? It’s still 9 points. If you used jarred marinara as opposed to crushed tomatoes which I use in my sauce it will be higher. can I use arborio rice instead of long grain? thanks! Made this today and followed the recipe but half the rice didn’t cover the bottom of a 9×15 pan. had to use all the rice to cover the bottom of the pan and it still wasn’t enough. Not sure what went wrong. Anyone else have this problem??? Same problem here. I would double the rice next time. It’s 2 cups uncooked which is about 4 cups cooked. Maybe you just had 2 cups cooked? When I made the 2 cups of uncooked rice there was plenty. That is where I went wrong. I used 2 cups of cooked rice. Made this as a luncheon appetizer along with other Antipasto.. The family loved it! I did not use the turkey but doubled up on the sausage. It was filling and plenty left over for the next day – which they all appreciated and took home. Even the grand children enjoyed it. Can you do this without breadcrumbs to make gluten friendly? couldn’t you just use GF bread crumbs? Can you do this with riced cauliflower. I used half riced cauliflower and half rice. It was perfect! Melanie did you cook the cauliflower rice first? This is FABULOUS! I made this last night and everyone in the family licked the plate! I halved the recipe since there are only 4 of us. I did it in a 9×9 pan. Excellent recipe Gina!